Sports betting is one of the most popular ways to gamble in the world, and there are a number of different ways in which you can participate. If you enjoy or follow a sport, chances are there are numerous betting odds available for that sport at an online sportsbook, especially if it's a popular league. With each passing year, the availability of betting odds continues to open up to people all over the world thanks to online sportsbooks. Of course, there’s a lot more to placing sports wagers than simply knowing that betting odds are out there. This is why we’ve put this little sports betting primer together. Here at USAOnlineSportsbooks.com, we want to explain the different betting odds that you will come across when trying to seek out the different sports, leagues, games, and players you are most interested in. It's not too complicated, but a basic understanding of what you’re looking at is essential when it comes to placing your chosen wagers. Just below, we will go down the list of the basic types of betting odds that are readily available, so you’ll know exactly what you’re looking at regardless of which online sportsbook you use. Directly below we have broken down the basic types of odds and betting lines that you are likely to encounter when gambling at a sportsbook. All wagers fall into one of these categories, which we explain in detail. Chances are that you’ve already heard these terms or are passingly familiar with these odds types, but in case you aren’t, we’ve got explanations and examples to help you out. Sometimes called “game odds,” the main betting lines you’ll come across at any reputable USA online sportsbook comprise three different wager types, and they’re almost always published together, in a line. This is what sports bettors refer to when they talk about a betting line on a given contest, although sometimes they use this term to discuss individual wager types within the betting line. The three wager varieties that comprise main betting lines are the point spread, the straight moneyline, and the over/under (and they’re usually listed in this order). Here, the Packers are favorites, which are always denoted by a negative spread number. Here, they are 7.5-point favorites. Conversely, the Vikings, with a positive spread number, are 7.5-point underdogs. This means that a wager for Green Bay to “cover the spread” means that the Packers have to beat Minnesota by at least 8 points to make the bet a winner. Similarly, the Vikes can lose by up to 7 points and still win the wager. The moneyline is shown in parentheses, and this represents the “price tag” for the bet (i.e. how much you must risk to get a given payout). In this game, the Lakers are underdogs while the Celtics are favorites. A positive moneyline number shows how much money you stand to win on a $100 wager, and a negative moneyline number shows how much money you have to risk in order to win $100. This is true for all moneylines, regardless of bet type. The only difference with straight betting is that the moneyline also shows which club is favored by the sportsbook. In the above example, a $100 bet on LA to win would net $255, while a $175 bet on Boston to win would earn you $100. Here, the sportsbook has set the over/under at 8.5 runs. If you take the over, and the game ends in a final score of 6-3, you’d win the bet, since 9 is more than 8.5. However, if you take the under, you’d lose the bet. The moneyline in parentheses shows that the cost for either side of this wager is the same: You must risk $110 to win $100. The remainder goes to the sportsbook as the house take, or vigorish. Futures odds are betting lines formed for an outcome that is usually some time out from the time you place your bet. Futures can be found in almost every sport, and the most common ones include a team’s odds to win the Super Bowl or the World Series. Usually, futures are first posted months, or even close to a year, before the given event is set to begin. As a rule, the earlier you place a futures bet, the better the payout will be. For example, in the NCAA, you might see football futures posted months before the season starts. Let’s say the Alabama Crimson Tide are the pre-season favorites to win the championship. As such, they might have futures odds of +300 or so, while the next team on the list trends at +500. If you place your wager on Bama before the season starts, you can get a nice payout. However, once the season is underway, if Alabama really pulls away as the best team in the nation, those futures odds could shrink significantly as the postseason approaches. If you place your bet on the Tide with only a few games to go before the CFP, you might get far more expensive odds in the neighborhood of -150 or more. Futures odds are all about timing, but as with most sports bets, if you see a line you like, you want to place your bet ASAP. Player proposition bets are wagers that concern the performances of a given player in a single game. The bigger the game or more anticipated the matchup, the more player props you’re likely to find at your online sportsbook. Common examples of what to expect with player props are over/unders on how many TDs a QB will throw or how many passes a wideout will catch. You might see lines on the number of strikeouts a pitcher will earn, how many goals a winger will score, and how many rebounds the big man will haul in. Additionally, props tend to include lots of “yes/no” bets as well. As a general rule, prop prices will be set at or around -110 on the odds boards. Team propositions are just like player props, except that they deal with team-based single-game performances. The most common team props you’ll come across will be on things like how many yards the offense will rack up, how many turnovers the defense will force, how many hits a club will get, how many fast-break points a team will score, and more. Like player props, most team props are of the over/under or yes/no variety, and they come with moneylines around -110. And, of course, the bigger the matchup, the more team props there are. The Super Bowl is the single sporting event with the most prop wagers posted year in and year out, with the game typically yielding about 400 different prop bets. Live betting is a unique way to wager that’s quickly becoming the most popular betting phenomenon at both land-based and online US sportsbooks. Live betting, aka in-game betting, allows bettors to place wagers live, during the actual action of a given game. These real-time odds are posted every few seconds, changing to reflect the pace and trends of the game as its played in real-time. Most live betting opportunities focus on the main line wager types above, though prop bets can also sometimes be adjusted as a game goes on. As such, there are many good reasons to enjoy live betting, not the least of which is the simple fact that being able to wager on a play-by-play basis is just an immersive, fun experience. From a financial perspective, though, it can also present several opportunities to bettors looking after their bottom lines. For example, if you make a traditional pre-game bet that goes sideways in a hurry, you can use live betting to mitigate or even cancel out your losses. The other side of that coin, of course, is that live betting gives you a chance to double down on a good bet, padding your bankroll more than a simple pre-game wager would. Live betting is available via mobile and at your site’s standard desktop book, so you can access this type of betting no matter where you are. On average, in-game wagering gives you several hundreds of individual, distinct betting opportunities for every featured game, boosting your daily chances to win by thousands of wagers across the board. Most sportsbooks will even give you a risk-free wager bonus when you make your very first live wager, so you can see if this type of sports betting is for you with zero risk attached! In reality, every quality online sportsbook should feature all of the types of odds we mentioned above, and if they don't, you need a new one. Below, we’ve listed our favorite sportsbooks that offer all of the above (and more!). It's easy to get stuck in a rut betting the same lines over and over and over again, but you can avoid that when wagering with our top choices for the best USA online sportsbooks. Variety, after all, is the spice of sports betting! Bovada is the most popular sports betting site in the US, with millions of members calling the sportsbook home. While Bovada excels at pretty much every aspect of online sports wagering, the site really shines when it comes to live betting, particularly via their award-winning mobile interface. For maximum enjoyment, live in-game betting really requires a smooth, easy-to-browse interface that is optimized for quick wagers. When you only have a few seconds to get your bets in, you definitely don’t want to be messing around on betting boards that don’t put those odds front and center. Bovada does exactly that, and they do it better than anyone else. BetOnline Sportsbook: - Bettors From All States Welcome + Bitcoin Accepted! BetOnline is a world-class sportsbook that’s been in business since the beginning of Internet sports wagering itself. While most users already use BetOnline’s world-class mobile interface for all their sports betting needs, where this arrangement really pays off is with live betting. BetOnline was one of the very first books on the planet to offer live, in-game betting over the Internet, and they’ve been blazing that trail ever since. Just sign up, deposit via any method you like (we prefer Bitcoin or other cryptocurrencies like Litecoin, Ethereum, DASH, Bitcoin Cash, etc. ), and browse the live boards to see lines change in real-time. When you see a number you like, just tap, swipe, submit, and win! New members who join BetOnline can claim a variety of bonuses, but if live betting’s your game – or if you simply want to see what all the fuss is about without risking any of your own money – you can get their risk-free $25 free-play on your first ever live wager. If you win, that’s free money, and if you lose, simply email customer service within 24 hours and you’ll get a $25 credit added to your bankroll. MyBookie Sportsbook: - The Best New Sportsbook For Live Betting Action! MyBookie is comparatively new, having just launched in 2014. However, they haven’t been resting on their laurels, and they’re already regarded as one of the very best sportsbooks out there. MyBookie is especially unique in the way it’s tailored specifically to US-based players and US sports betting interests. They accept members from all 50 states, and they only post lines on the major US leagues. While this means that international sports fans would be better served by another sportsbook, if you’re only interested in NFL, NCAA, NBA, MLB, NHL, and MMA action, MyBookie has some of the most competitive lines available for these sports. MyBookie spared no expense in designing their gambling interface, and that makes live betting at the site easy and enjoyable. The odds boards are easy to browse, and every update is posted in a timely manner, with auto-refreshes ensuring that every number you see is active and current. 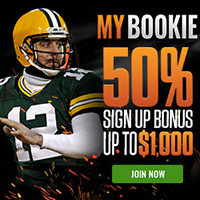 Though MyBookie doesn’t offer any specific live betting perks at this time, their 50% sportsbook welcome bonus (promo code MYB50) is good for up to $1000 in free-plays. Alternatively, you can get a $20 risk-free wager on your very first bet with the service, which is good for live bets and pre-game bets alike.